Tripura, one of the north-eastern states, is bounded on the north, west, south and southeast by Bangladesh, whereas in the east, it shares a common boundary with Assam and Mizoram. The state has favourable climatic conditions for cultivation of various fruit and horticultural crops. It is rich in natural resources such as natural gas, rubber, tea and medicinal plants. Tripura is endowed with rich and diverse bamboo resources. It is also the second largest natural rubber producer in the country after Kerala. Tripura accounts for about 6 per cent of bamboo sticks, used for making incense sticks in India. Around 21 of the 130 bamboo species known in India are grown in the state. Tripura holds a strong tea plantation base in India, with 54 tea gardens covering an area of over 7,482.27 hectares as of 2015-16. Due to large availability of land along with appropriate climatic conditions, a gradual boost to the tea production in the state has been witnessed.. In 2017-18, tea production in the state stood at 8.72 million kg. The state is also rich in natural gas deposits, glass sands, limestone, plastic clay and hard rock. As of February 2018, Tripura had a total installed power generation capacity of 733.44 megawatt (MW). With its pleasant climate and scenic landscape, Tripura is a favoured tourist destination. The state offers tourists attractions such as historical Hindu and Buddhist sites, temples, rivers and rock carvings. In 2017, the number of foreign tourist arrivals in the state were recorded to be 69,899. The state has favourable climatic conditions for cultivating various fruit and horticultural crops including rice, jackfruit, pineapple, potato, sugarcane, chilli and natural rubber. Rice is the major crop of the state and is cultivated in 91 per cent of the cropped area. The state has a wide variety of medical plants having 266 medicinal plants, 379 species of trees, 581 herbs, 320 shrubs and 165 climbers. 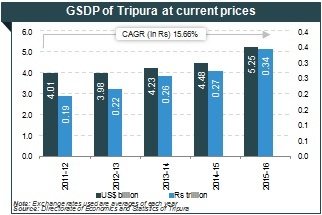 The Guwahati-region which includes Assam, Arunachal Pradesh, Manipur, Meghalaya, Mizoram, Nagaland and Tripura has attracted Foreign Direct Investment (FDI) equity inflows worth US$ 113 million during the period April 2000 to December 2018, according to data released by Department for Promotion of Industry and Internal Trade (DPIIT),. Tripura has 87.8 per cent literacy rate, higher than the national average rate, making it an ideal destination for knowledge sectors. The state has a wide range of fiscal and policy incentives for businesses under the Tripura Industrial Investment Promotion Incentive Scheme, 2012. Developing infrastructure, improved rail & air connectivity, and establishment of trade routes have facilitated trade. The agro-climatic conditions in the state are favourable for growing various fruits and horticultural crops. Tripura’s pineapples and oranges are known for their unique flavour and organic nature. As per the 1st advance estimate of 2018-19, total fruit production in the state is 525.42 thousand MT, total vegetables production is 791.13 thousand MT, total plantation production is 40.13 thousand MT, total spices production is 30.22 thousand MT. 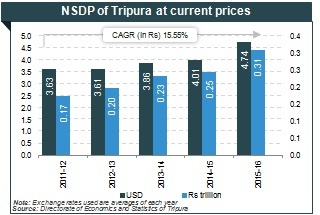 Tripura has vast natural gas reserves. The gas is available in a non-associate form, with high methane content of about 97.0 per cent. Concessional gas-pricing and vast reserves offer potential for setting up industries in the sector. Natural Gas production in Tripura during 2017- 18 (up to March 2018) stood at 1,439 million cubic metres (mcm). Tea grown in Tripura is known for its good blending qualities. Organic tea and green tea production have been undertaken by some of the tea estates in the state. Tea production is a growing industry in Tripura and provides a considerable scope for investment. Boost to Development Projects in North East; First Meeting of the NITI Forum for North East in Agartala on April 10.